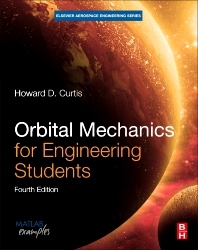 Orbital Mechanics for Engineering Students, Fourth Edition, is a key text for students of aerospace engineering. While this latest edition has been updated with new content and included sample problems, it also retains its teach-by-example approach that emphasizes analytical procedures, computer-implemented algorithms, and the most comprehensive support package available, including fully worked solutions, PPT lecture slides, and animations of selected topics. Highly illustrated and fully supported with downloadable MATLAB algorithms for project and practical work, this book provides all the tools needed to fully understand the subject. Professor Curtis is former professor and department chair of Aerospace Engineering at Embry-Riddle Aeronautical University. He is a licensed professional engineer and is the author of two textbooks (Orbital Mechanics 3e, Elsevier 2013, and Fundamentals of Aircraft Structural Analysis, McGraw Hill 1997). His research specialties include continuum mechanics, structures, dynamics, and orbital mechanics.